On sale in April, Suzuki is pleased to announce some great news for buyers of the all new Vitara ALLGRIP DDiS model which is the cleanest non-hybrid 4×4 on the market. CO2 emissions are just 111g/km for the 1.6-litre DDiS SZ5 ALLGRIP model with an EC combined fuel consumption figure of 67.2mpg. It’s not just in the 4×4 SUV segment that Suzuki excels either, as the recently launched Swift 4×4 Dualjet model at £14,199 also emits 111g/km and, in the Crossover segment, the S-Cross 1.6DDiS SZ-T at £21,299 is only slightly higher at 114g/km. 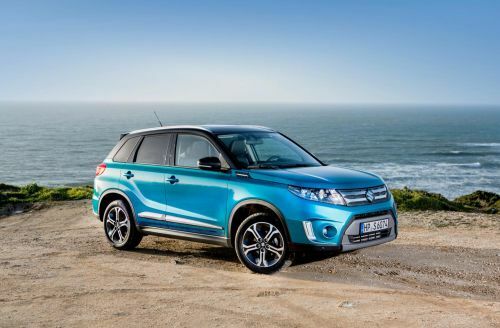 From the launch of Vitara in April, Suzuki will offer three low CO2 emission 4×4 models from its range and these are all within the top four most fuel efficient 4x4s on the market. At £21,299 for the SZ5 DDiS ALLGRIP, buyers would need to spend almost £6,000 more to gain any advantage in emissions by moving to a competitor model that utilises a hybrid drive system. Four-wheel drive is typically seen as detrimental to fuel economy and emissions performance. By contrast, Suzuki’s ALLGRIP system enables CO2 emissions that are remarkably low for a four-wheel drive petrol-powered SUV as well, with figures of 130g/km with five-speed manual transmission and 131g/km with optional six-speed automatic transmission that will be available in the summer. Standard equipment specification for the SZ4 model includes seven airbags, 16-inch alloy wheels, DAB Radio with USB and Bluetooth connectivity, Cruise Control with speed limiter, auto air conditioning, front and rear electric windows and projector headlamps. SZ-T adds 17-inch silver painted alloy wheels, rear privacy glass, Smartphone link audio and navigation system. Moving up to SZ5 adds LED Projector headlights, 17-inch polished alloy wheels, suede seat fabric, keyless entry with start button, Adaptive Cruise Control, Radar Brake Support and Panaoramic sunroof.